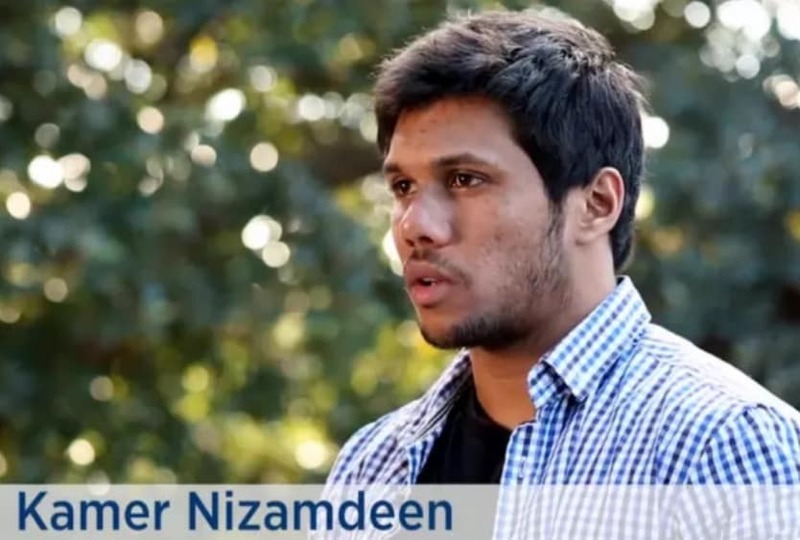 Kamer Nizamdeen, an alumnus of St. Thomas’s prep and the Asian International School in Colombo pursued his higher education at the University of South Wales [UNSW] in Sydney, Australia. He has been arrested on charges of planning to blow up Sydney and assassinate prominent Australians on behalf of IS or Islamic State. During the time of his arrest, he was studying at UNSW and was working on a highly classified project with the Australian police. As a cyber security expert, he was working with the Australian police to develop software for surveillance, identity theft and cyber security. Australian media reports claim that a notebook was found that probably belonged to Kamer and handed over to the police by a colleague, which had plotting for a terror attack in Sydney. Kamer denies that the hand writing in the notebook is his. The police also claim that they found electronics, i.e. a laptop, an Xbox and a mobile phone in his apartment, which are supposed to be the sophisticated electronic gadgets that he had amassed to blow up Sydney Harbour? Kamer hails from a very moderate and highly respected Muslim family in Sri Lanka. His grandfather was the well-known Jehan Cassim, a former Chairman of the Bank Of Ceylon, the country’s premier state bank. Kamer experimented with creative advertising at one of Sri Lanka’s lead advertising companies, Triad, before moving to pursue his higher studies in Australia 8 years ago. Media, and some extremist websites including opposition MP Wimal Weerawansa’s C-News have attempted to imply that Kamer is the nephew of Minister of Sports and Provincial Councils Hon. Faizer Mustapha to create a negative image of the Government. He is in fact the Hon. Minister’s wife’s sister’s son. I was several years senior to Kamer at St. Thomas’s Prep but adored him when I met him in Sydney in later years as a fellow Thomian and a quiet but entertaining “Thambi” who would liven up any occasion. His intellectual capacity is well above average, but an unassuming and down to earth individual. Sri Lankans and Australians who had the good fortune of interacting with Kamer will vouch that he did not have an iota of fundamentalism or Islamic extremism in him, leave alone be part of an IS terror gang. I can line up a 100 Australians and Sri Lankans with minutes to vouch for his innocence. So, why was Kamer arrested? The mystery is complex. Was he the victim of a jealous colleague or colleagues, or did he stumble on some top secret of the Australian Government in his cyber security work for the Australian Police? Was he framed, only time will tell? The West has had a phobia for anyone with a Muslim name. Australia is no exception. Islamophobia and violence against Muslims have been the hallmark of racism against the Muslim community in Australia with the influx of a large number of migrants of Arab or Muslim descent. The widespread immigration from the so-called Muslim and Arab countries has caused friction between the local Australian population and other immigrants from neighbouring countries of Australia too. Australia, which is part of the US nexus on the so-called war on terror, has managed to destroy the entire Middle Eastern economy. Libya, Iraq and Syria were once the pride of Arab development. With the “war on terror” campaign spearheaded by USA, it has reduced these countries to mere rubble. Talking to a Muslim colleague from Sri Lanka, I gathered some interesting facts. He insists that IS is the creation of the West and was used to destroy Muslim nations. Interestingly, Sri Lanka was one of the first countries to name ISIS as not Islamic and should be considered a mere terrorists group. The Head of the Muslim theologians (ACJU) in Sri Lanka Mr. Rizvi Mufthi had over a radio broadcast declared 4 years ago that ISIS is a terrorist group and had nothing to do with Islam. Mufthi and his religious scholars have repeated this during many Friday sermons in mosques across the country. Despite the efforts of the religious leaders, a few members of one family from Sri Lanka had joined IS in Syria. Sharfaz Nilam Muhain, a 27 year old Sri Lankan Muslim was killed while fighting with the ISIS forces. The Muslim civil society and religious leaders came out strongly against some racist groups that were trying to implicate the entire Muslim community as being sympathetic to the ISIS cause. They called upon the Government to investigate and punish any individual who may be promoting the ISIS ideology. The Government intelligence units on the orders of former defence secretary, Gotabaya Rajapaksa undertook a thorough investigation and found no major cause for concern. Most of the members of Sharfaz Nilam Muhain’s family too returned. They had claimed that they went to Syria to provide humanitarian support to the war affected refugees. Sri Lanka has no sympathy for IS or any separatist or terrorist group. Kamer, or any other Sri Lankan would not have access to these ideologies in schools or universities in Sri Lanka. So, it is unlikely that a rational person like Kamer would subscribe to this violent ideology. He loved Australia as much as he loved Sri Lanka. I can confidently say, he is innocent and the courts of law in Australia will discharge him without any blemish. When I made awareness of the Aboriginal people’s and refugees hardships the Australian government deleted my citizenship, stripped me financially and turmertised me as an illegal immigrant. The Australian police may have framed innocent people and this kid may have raised his voice. Anything is possible in Australia. I don’t have that much faith in the Australian legal system or media. Or is it possible some ISIS agent set this guy up for working with the Aussy police? He is probably seen as a traitor by the ISIS for obvious reasons. If he were a real terrorist he wouldn’t be so stupid to keep a notebook with all the incriminating evidence, particularly with his kind of ability and interlect! Would you? Come on guys. Lets think logically. I liven Australia with my family having migrated from Lanka in the 1990’s due to the civil war and our home affected by a bomb blast in Colombo.I belong the the same Moor Community as Kamar and was quite shocked with his arrest since most of our Moor boys are moderate in the practice of Islam without taking it to extremes.I do not know the young man however I do hope he is innocent of the alleged crime.We as Australians now of many years certainly would not want to see an act of Terrorism committed on Australian soil. Those of us who live here gave up our professions and moved from Lanka only to be safe from the ongoing acts of terror in our beautiful Sri Lanka and certainly would not want it on Australian soil. May God keep us safe from this here in Australia. The powerful Lankan minister has gone silent. I think the young man is guilty and the family knows it. Australia will never tolerate terrorism. This boy should be happy as there is no death sentence in Australia, only life. JErome Schokman: what it does say do not try to be smart in those countries. some how you will be screwed up. So, stay second class citizen. See what happened to Michale JAckson and to bill cosby. IT like SExual assulats is not something unheard in thir land. Not many people know what they do to Aborginies.